Slow Cooker Red Beans & Rice - dried red beans, andouille sausage, water, tomato sauce, Worcestershire, onion, green pepper and cajun seasoning - serve over hot white rice. This is the best red beans and rice outside of New Orleans! SO easy and crazy delicious! Our at home Mardi Gras celebration continues with red beans and rice. I don't know about you, but I can't say red beans and rice without busting into Sir Mix Alot's Baby Got Back. "Give me a sista I can't resist her - Red beans and rice didn't miss her"
We made a big pot of red beans and rice last weekend, and it really hit the spot! We both gave this rave reviews. This version of red beans and rice could not be easier; just toss everything in the crock pot and let it slow cook all day. There is no need to presoak the beans, just toss them in the crock pot with the rest of the ingredients. We whipped up a pan of cornbread to complete the meal. 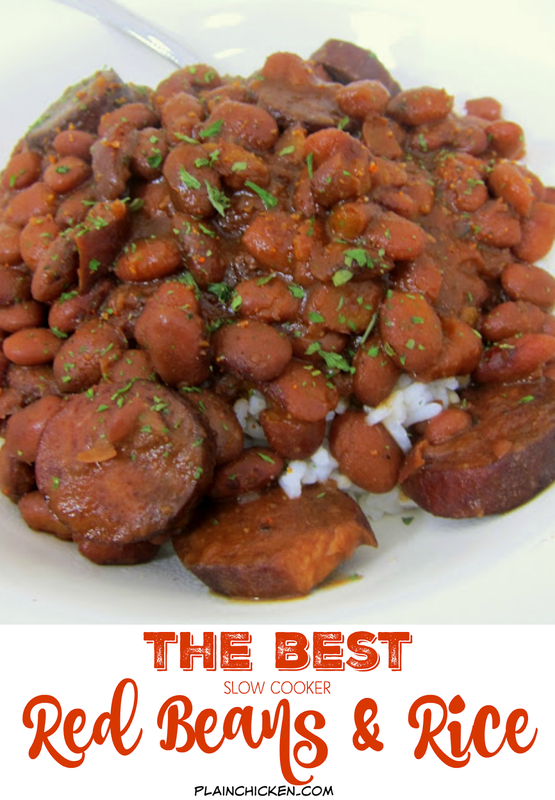 Don't miss these red beans and rice! Combine all ingredients in slow cooker and cook on low 8-10 hours. Serve over hot white rice. This sounds DEEEEEEE-lish! Can't wait to try it. Red beans and rice is one of my hubbies favorite things he picks to cook. I've never had red beans & rice, and haven't ever had Cajun food because I'd been told it's spicy. I can't handle spice above "Mild" (think Mild salsa or Mild sauce packets @Taco Bell). Should I, then, use only 1 Tbs Cajun seasoning? Or even less? Thanks! This wasn't spicy. You could reduce the Cajun seasoning to 1 tablespoon, but I wouldn't go less than that. This looks really yummy! Sounds like corn bread would go perfectly with it! I love, love, love your blog! You have the best recipes! High five, girl! Steph I also love your blog. Your recipes are not too fancy for us plain folks and most of the ingredients are in the pantry. I have not been following you long but I pin most your recipes on Pinterest and always have lots of repins. We have red beans and rice quite often. There is now a packaged red beans...has the seasoning packet that is too perfection. All you do is add your sausage and water.Has directions on the package. It is called Ragin Cajun Fixins..OMG it is wonderful. I'm cajun and you can't beat this product LOL. 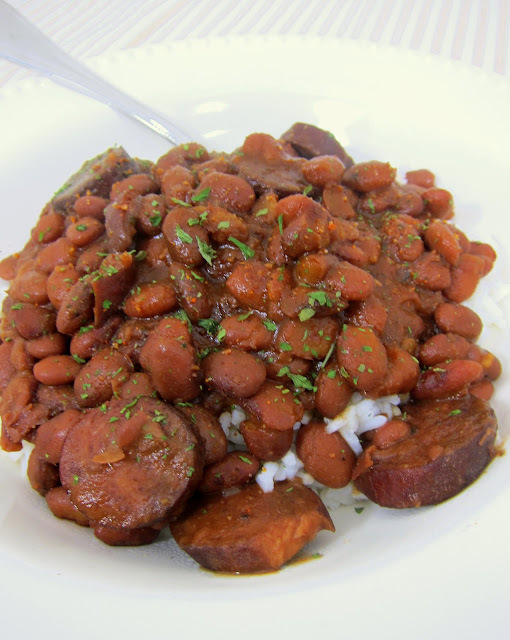 Red beans and rice rock, one of my favorite side dishes but I don't make them often enough. I like how easy your version is! Glad I'm not the only one who thinks of "Baby Got Back" when I hear "red beans and rice!" I Googled to see what's in Cajun seasoning, and I'll just make my own with less cayenne pepper. This is from allrecipes that makes 1/4 cup. Just store airtight! I think that the seasonings combination sounds very tasty, and I can't wait to try your recipe! I am currently making this. It has been in the crockpot 10 hours and the beans do not seem to be done. Does it take longer than the 10 hours mentioned in the instructions? Karijoy - mine was done in 10 hours, but all slow cookers are different. I may take longer in your slow cooker. When I try to save recipe it says the recipe is Garlic Parmesan Crusted Chicken??? and not Red Beans and Rice. Found you through Pinterest several weeks ago. I made this recipe last week (with quinoa instead of rice because it cooks faster than the brown rice I had)and wanted to tell you it was so good. We are Texans transplated to West Virginia and I swear these people up here think tomato sauce is spicy!! I saw in comments you said the dish wasn't spicy as is, but it was REALLY spicy to us (no complaints here), maybe the Creole seasoning I use is spicier than Cajun seasoning? Anyway, we LOVED it just as it was. Thank you for your blog. I love it!! (I've also made the chicken cordon bleu casserole and making the taco crescent bake tonight). I LOVED this recipe! Even better with a little bit of chopped up chipotle in adobo sauce for a little more kick plus a teaspoon of liquid smoke. Thanks! I was too lazy to change out of my PJs and go to the store (all day) to pick up a bell pepper and some Worcestershire, but it still came out AMAZING! So excited!! Love all of your recipes... The sausage cheese muffins are always a hit and this is going to become a regular in my house!! I've never had red beans and rice before but your recipe looked so delicious I just had to try it yesterday. It came out great! My husband and I both loved it. I'm eating it for lunch today and it is even tastier. Thanks! I tried this for the first time a few weeks ago-came across it on Pinterest. It was delicious! Every bit of this dish was eaten. I used a spicy chicken andouille sausage, instead of the smoked turkey, but followed everything else to the letter. It was spicy (which I love), but a little salty. I don't know if I need to reduce the cajun seasonings or try a different sausage. I have a spicy Chorizo on hand and thinking about trying that one out. I'll let you know how it turns out. I have dried read beans i want to use up so this will be perfect, thanks! So do you have to soak the beans before putting them in the crockpot? This baby is in the Crockpot for dinner tonight!! Keeping my fingers crossed. Happy Fat Tuesday y'all!! Is there anyway to thicken this up a bit? Ive been cooking it for about 8 hrs and its slightly thin..
Do any of you good people out there know of a Crock Pot recipe for Red Beans & Rice w/o the sausage &Tex-Mex flavor? I can't eat anything hot & spicy anymore (though, truth be told, I never much liked it anyway.) I'd like to make the Slow-cook beans/rice with chicken thighs as a one-pot dinner. Any ideas? Any recipes you know? "Foodies" have the best recipes! Thank you all! I have this cooking at the moment. I have sampled the juice and it is pretty hot, spice wise. I will cut back on the cajun spice next time.